Nokia 301 Dual Sim Bar phone is available for RS 5173 . Nokia 301 not just Dual sim ( Dual standby ) capability but also offers 3.5G internet Speed . So if you are Nokia lover and searching for a Bar phone that looks simple & attractive with 3G support then you should surely put your eyes on the device. the phone has 2.4inch display of 240X 320pixels resolution . The device has 3.2MP rear FF camera . The phone features 3G , 2G , Bluetooth 3.5mm audio jack & micro usb connectivity . Basically phones like this usually supports EDGE and GPRS , where as the 301 has 3G connectivity . 3G in the phone is the main key for the handset . The device looks stylish & the back of the device gives it premium look . Nokia handsets are much more durable then others . In case the handset got bricked , the handset can be repaired easily . As the spare parts of device are easily available in the market . The device has 64MB ram & 256MB ROM ( internal memory ) . The device has 12.5mm thickness . The device is powered by 1200mAh battery . The battery claims 6hours of talktime on 3G and 20 hours on 2G and the standby time of up to 500hours .The memory of the phone can be expandable upto 32Gb via micro sd card . 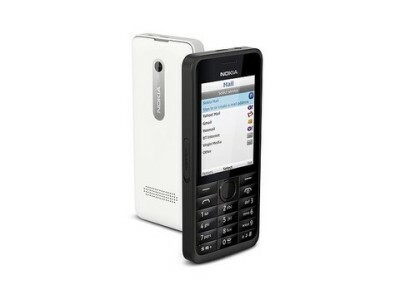 The 301 is running on Nokia series 40 platform ( OS ) . BUY Nokia 301 via Amazon .in .